Made Preliminary Arrangement for COE Field Station Cooperative Workshop in Ethiopia. 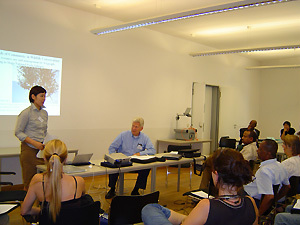 Preliminary arrangement was made for the workshop titled "Environment, Livelihood and Local Praxis in Asia and Africa." to be held at Addis Ababa University from 20th October 2003. Field Station equipments including internet and telephone systems were set up at the rented room near the campus of Addis Ababa University in order to facilitate the communication between Kyoto and Ethiopia Field Station. For the workshop program and abstracts of the presentations, and for details of Field Study Tour, please see, http://areainfo.asafas.kyoto-u.ac.jp/efs/e/workshop.html. 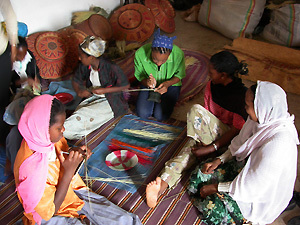 In Harar, eastern Ethiopia, Ms. Belle Asante, an ASAFAS graduate student (year of enrollment: 2002, Monbusho foreign scholarship student), has conducted field research on the "Craft Associations and Traditional basketry among Harari Women in Ethiopia." I visited her research site and had discussion on the topic of the research. Ms. Asante also made a presentation at a seminar held at the Ethiopia Field Station, Addis Ababa. Dr. Gebre Yntiso, a former ASAFAS research fellow also attended the seminar. For the detail of the activities of Ethiopia Field Station (EFS), please see EFS Home Page at http://areainfo.asafas.kyoto-u.ac.jp/efs/index.html. Ms. Belle Asante, a graduate student of ASAFAS, is conducting field research among the women basket makers in the walled city of Harar. Ms. Asante is a Monbusho scholarship student from USA (year of enrollment: 2002)(Photo by Ms. Asante). Ms. Nobuko Nishizaki, a graduate student of ASAFAS (year of enrollment: 2002) is presenting her paper at the session of the15th International Conference of Ethiopian Studies, held in Hamburg, Germany. In this conference. five students and one faculty from ASAFAS have read academic papers as a contribution from their research and educational activities at Ethiopia Field Station. 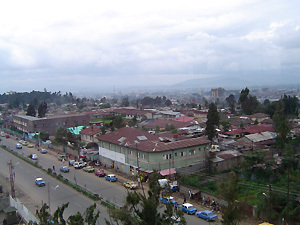 Addis Ababa in August, it is predominantly cloudy and often rainy and chilly. People await the coming of sunshine until mid-September which is the beginning of New Year in Ethiopian calendar. Preparation of the coming workshop hosted by Ethiopia Field Station and Addis Ababa University is under way.